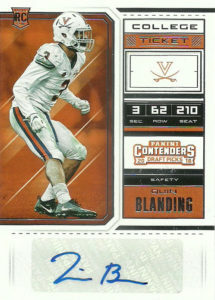 Quin Blanding played collegially for Virginia from 2014 to 2017. He contributed immediately to the secondary as a true Freshman and racked up impressive numbers. After setting Freshman tackle records with 123 in 2014, he went on to record 115+ tackles in every year he was at Virginia. Blanding finished his college career with 492 total tackles, 9 tackles for loss, 1 sack, 16 passes defended, 2 fumble recoveries, and 10 interceptions for 108 yards and a TD. Highly accoladed, Blanding earned the ACC Defensive Rookie of the Year Award (2014), Freshman All-American (2014), first-team all-conference honors (2015), and All-ACC Honors (2016, 2017). So even though the numbers and accolades spoke for themselves, scouts soured on Blanding’s speed, and lack of ‘game-breaking’ presence. While this would not be a deal breaker in other drafts, the unusually high grade of defensive back talent continued through the 2018 Draft. I had him sneaking in at the back of round 6 or early in round 7 as a developmental prospect for the Houston Texans, but Quin would go undrafted. He’d sign a free agent contract with the Washington Redskins, but be waived in final cutdowns. Quin’s autograph is pretty pedestrian- especially for a guy who has a ‘Q’ in it. It really looks more like a signature than an autograph really. The card itself is broken up well into 3 main sections: Player portrait, player stats, and player autograph. It’s a nice looking card, but I feel like the player portrait is a bit busy and overproduced.